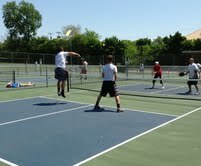 Thanks for Helping – Rossford Gym Class Pickleball 2013 – Pickleball is Thriving in Northwest Ohio! Many thanks to Connie Mierjewski and Jim Barnhart for leading the effort to instruct Rossford High School students on the rules of Pickleball. Connie and Jim handled four classes on their own on Thursday. On Friday, Susan DeAngelis, Diane Pacella, Bob Lineen, and Sandy Kushma joined the fun, and volunteers were treated to lunch at Moe’s. All the kids were happy to be outside and wonderful to work with–it’s great that they now understand exactly what is going on in their neighborhood on their school’s former tennis courts. The best part of Friday was seeing Rossford High student Johnny Pupik, son of Susan DeAngelis, play well and enthusiastically. His game really developed over a short time–he attended some of our winter sessions at Rossford Rec. We hope to see you at the courts this summer, Johnny. Remember, kids under 18 play free, so tell your friends. This entry was posted in Promote Pickleball. Bookmark the permalink. Miss everyone! Will come sometime to help out with the kids. Can give verbal instruction and help with strategy etc. Hi to all! !